The East Coast Mainline (ECML) is the main route running from Aberdeen to London Kings Cross via Edinburgh, Berwick and Newcastle, hugging the east coast of Scotland and North East England before taking a more inland path more or less after Durham. However, controversially, Network Rail only describe the ECML as being between Edinburgh and London King's Cross. The constituent companies that made up the ECML were originally the North British Railway in Scotland and the North Eastern Railway and Great Northern Railways in England. These came under the umbrella of the LNER upon Grouping in 1923 and British Railways on Nationalisation in 1948. British Railways became British Rail around about 1964 and upon privatisation a plethora of railway companies now run services on the ECML the main being ScotRail, East Coast and Arriva Crosscountry although there are others as you progress South from Newcastle through York, Peterborough etc into the London suburbs. When electrification was extended from Edinburgh to Glasgow Central via Carstairs, the ECML took on an extension over the former LMS West Coast Mainline from Carstairs into Glasgow Central. 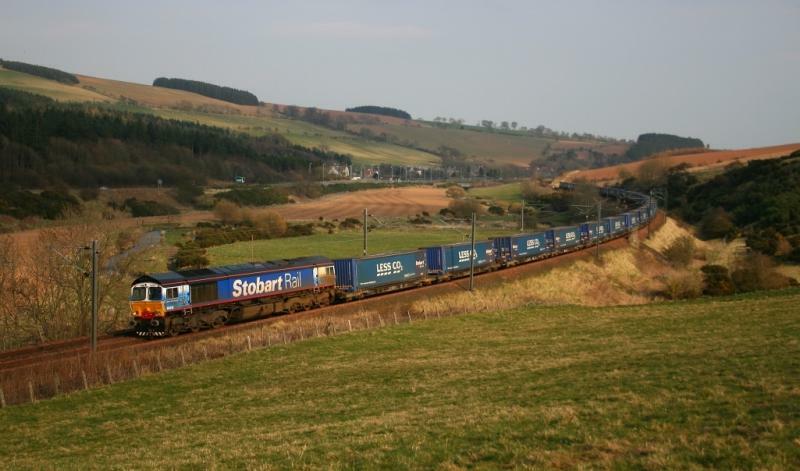 Anglo Scottish Glasgow/Edinburgh/ London services originally were operated by Great North Eastern Railway, a subsidiary of Sea Containers Ltd. They have now relinquished this in favour of the aforementioned National Express East Coast. The cross country services were operated by Virgin who have now given over to Arriva. Stations served nowadays are Glasgow Central, Motherwell, Carstairs, Edinburgh Haymarket, Edinburgh Waverley, Dunbar, Berwick Upon Tweed, Alnmouth, Morpeth, Newcastle, Durham, Darlington, Northallerton, York, Doncaster, Retford, Newark North Gate, Grantham, Peterborough, Stevenage and London King's Cross. Created by glasgow246 and last modified by aberdonian at 14:16, 01 of August 2010.